In my previous article I highlighted the Center for Digital Government’s Government Experience awards and said I’d look in more detail at the Government to Business award winners. Well today is the day! Two of the winners of this category - Los Angeles City and the City of Long Beach - were recipients of a three-year funding deal of the Bloomberg Philanthropies’ Mayors Challenge. When it comes to doing a Government to Business portal well, the City of Long Beach’s BizPort is justifiably recognized. Put simply if you want a template for a business portal your government organization should sit up and pay attention to Long Beach. Bizport’s design is simple, customer focused and highly intuitive. To get a site this good, you know they would’ve completed a bucketload of customer research with business owners. The highly prominent Youtube video draws in your attention first. And at only 42 seconds the length doesn’t discourage a business owner from getting a succinct and useful overview for what you can do on the site. Below the video is a site wide search function that plugs in Google’s customizable solution followed by its main navigation. This is cleverly architectured with simple calls to action based on the business lifecycle of planning a new business, launching it and then growing it. With its small drop down arrow it tempts the business customer to find out more about the topic. By clicking on either “Plan”, “Launch” or “Grow” the next layer of information architecture becomes available as it seamlessly opens up. The tabbed approach under “Launch” for where your business will be located, home based or at a business premise, quickly filters what you need, and don’t need to know. The content at this level is well organized and written. The site does a good job of providing on-page content while also hyperlinking to relevant resources elsewhere. And while some Government to Business websites do this in a way that feels like an afterthought, BizPort’s approach feels like an integrated experience. Bizport’s account functionality makes it easy for business intenders. 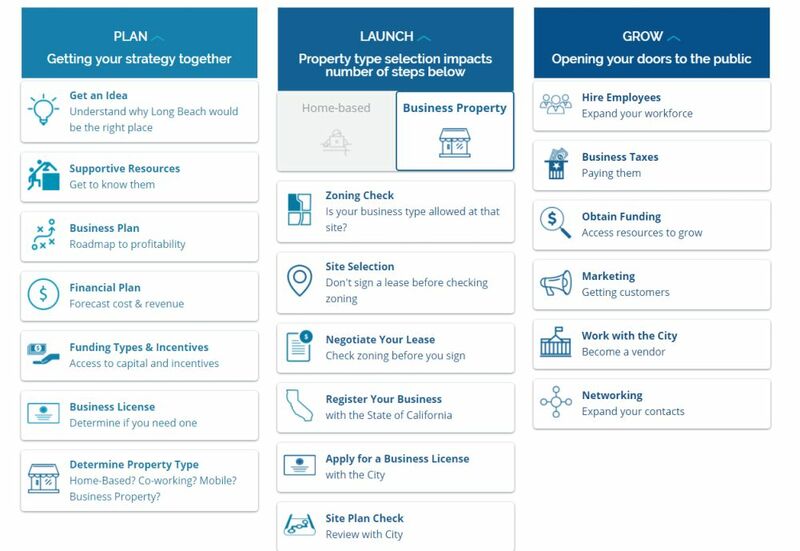 By interfacing with Long Beach’s useful checklist process, business customers get a clear step by step path for starting their business. Is there any room to improve? It should be very clear how impressed I am with the City of Long Beach and what they have achieved with BizPort. The branding for the site with its complementary color scheme, font families and .GOV domain work well together. 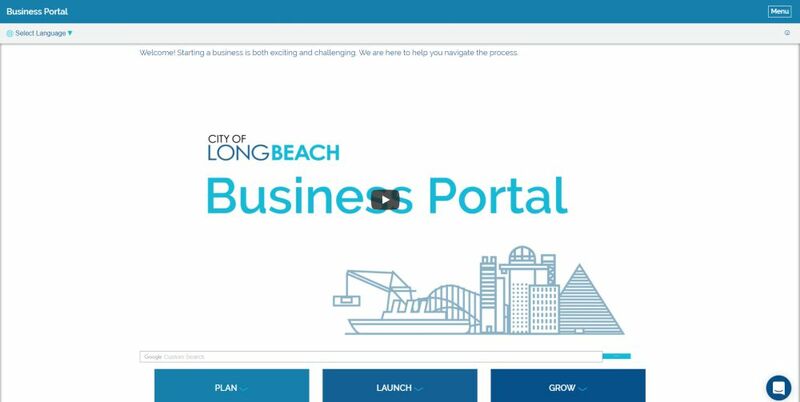 You do get the City of Long Beach’s corporate logo in its Youtube video on the homepage, but beyond this each page just carries the words “Business Portal” without any reference to the governing area. This is one small area Long Beach could improve on. While the content is nicely bite sized, it is limited in some parts of the site. This creates sections of an inconsistent experience with some pages giving a great overview, but others only a taste of what they should do. Again, this is something that can be addressed over time as resources become available. The “Obtain funding” tool while clean and easy to use, also lacks a little detail. A number of incentives for small businesses setting up or growing in Long Beach don’t provide much background on eligibility or the process. While a form to apply is available, it can’t be completed online which is a odd as you can apply and pay online for your business license. I’d previously visited Long Beach’s business licensing application and it seamlessly logged me in on return. Which is fantastic. Yet the same functionality didn’t seamlessly integrate into accessing the BizPort checklist. This is a minor thing, but ideally the principle of identifying who you are only once is preferable. Long Beach’s online chat is a great result for customers during standard business hours but outside this it can only capture your query and email address to get back to you the next day. This makes it clear to the business customer and sets expectations while managing government costs, but with some leading Government to Business organizations implementing natural language bots, it’s an area that Long Beach could enhance in the future. One thing I want to be really clear about is Long Beach is doing a great job of delivering Government to Business services online. If you were looking for examples of global leaders, they’d be on my list. So my comments on how they can improve is akin to how a student take an A can get to an A+. What happens when the dollars dry up? Long Beach has been able to achieve so much with their i-team thanks to $3 million of funding from the Bloomberg Philanthropies over a three year period. But their limited life support ends this calendar year. With so much achieved, the big question for Long Beach and other similarly funded cities and counties is what do they plan to do next. How will they take their investment they’ve made into the future and continue to deliver for businesses in their local jurisdiction? BizPort has already addressed this. The i-team has transferred “business as usual” responsibility for the site to the City’s Economic Development team. The Innovation team’s focus has moved onto a new public safety challenge to address. When it comes to how Long Beach plan to keep the ball rolling on innovation and new projects both for BizPort and more broadly across the City, Director of Economic Development, John Keisler, helps fill in the blanks. If your city planned ahead and got in early with Bloomberg Philanthropies’ 2017 Mayors Challenge you’d be joining great company. But with 555 cities applying across all states and only five winners the competition is going to be brutal. The folks at Bloomberg Philanthropies have been criss-crossing the nation conducting 300 workshops. With cities quickly being brought up to speed on i-team strategies and tools they’re better positioned to finalise their applications that close in two days on 20 October. Then the whittling down process begins, with just 35 cities being advised in January 2018 about their successful shortlisting. Normally if you’re shortlisted in anything, unless you go on to win, you generally don’t get much benefit. But that’s not the case with Bloomberg Philanthropies, which is another reason why their leadership on this is excellent. Shortlisted cities receive an initial $100,000 to test and refine their proposed idea to solve a local problem. It’s a great way for Bloomberg Philanthropies to push the “fail fast” philosophy of the private sector by getting a more accurate understanding of which city is likely to deliver the greatest benefit and then funding them. And with one winner grabbing $5 million and four others $1 million, the impact and learnings for all cities will be significant. You just have to look to Long Beach and Los Angeles and emulate the best of what they deliver to business. It’s not dead easy and there is still a lot of work understandably needed. But with the information sharing being distributed about their experience improving the business customer experience in their jurisdictions, it is sure a great way for your city to level up.